It’s easy to spend big money in the big apple. But if you’re like me, you probably want to indulge in some unusual cuisines and be on your way to Central America; I leave in 24 hours for Guatemala! In my three weeks in NYC, I’ve had my fair share of fun with tons of free things to do, free events and free activities to choose from. Seeing a gorgeous sunset over the Hudson is one thing, but rowing your way through its bays and open expanses in the backdrop of imposing skyscrapers is quite another. Pick a sunny day and head over to The Downtown Boathouse, Manhattan Community Boathouse or Brooklyn Bridge Park Boathouse, for 20 minutes of free kayaking on any day between May and October, or a more challenging 3-hour kayak trip on some weekends and public holidays. Kayaking on the Hudson. Photo by James Russo. Every Saturday, from 1 pm to 5 pm, Brooklyn Brewery along the cobbled streets of Williamsburg, opens its doors to visitors big on beer and small on the wallet. You spend an hour behind the scenes of one of New York’s favorite beers, and sample complimentary brews for a perfect start to the weekend. Unfortunately for Manhattan dwellers, Chelsea Brewing Company, the largest microbrewery in the borough, closed its doors earlier this year. Beer tasting. Photo by Quinn Dombrowski. Two thousand cherry trees were gifted by Japan to New York City in 1912, and most of them planted at Sakura Park; “sakura” means cherry blossom in Japanese. While many parks in NYC (including Central Park and the Brooklyn Botanic Garden) have cherry trees scattered in their midst, Sakura, in Morningside Heights, is the only park entirely dedicated to them. I might not be around till spring to witness the spectacular cherry blossoms, but if you are, I’m sure it’ll be worth your while! Cherry blossoms in bloom. Photo by Charley Lhasa. If you find yourself craving a cosy music venue without having to fork out money for cover charge or drinks at a bar, make your way to lower Manhattan, where Rockwood Music Hall offers free concerts on most weekdays and weekends. Budding artists and local bands play everything from jazz to R&B and Hip Hop. It’s all for the love of good music. For the love of music. Photo by William Kates. Why pay 12$ for a tourist ferry to Staten Island, when you can hop on to the commuter cargo ferry for free? Board from Lower Manhattan, and sail away from the city’s iconic skyscrapers, holding your breath when the famous State of Liberty finally comes into focus on the far end of the 25 minute journey. 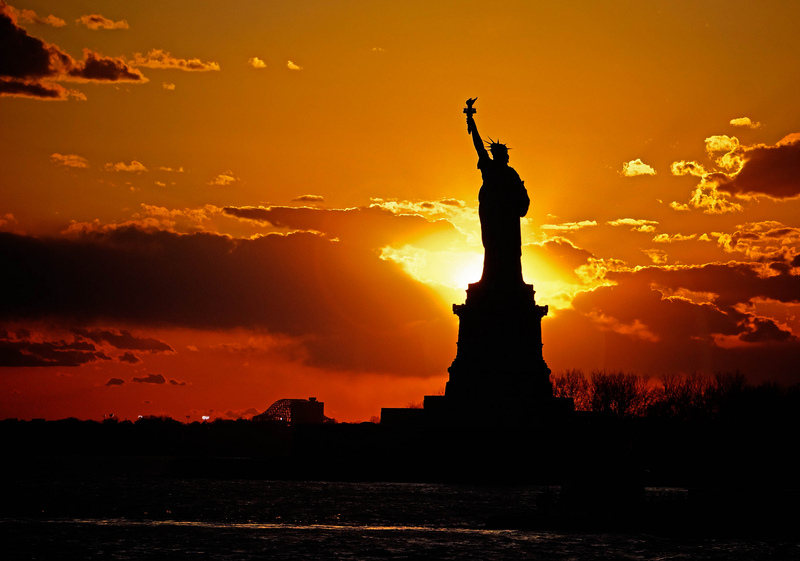 Sunset over the Statue of Liberty. Photo by Bob Jagendorf. Mark Twain and Theodore Roosevelt were once residents of the century-old Wave Hill estate in upper Manhattan, now a pretty public park and a venue for poetry recitals and author readings. Go on Tuesday, when admission to the estate is free, and make use of the free shuttle from the end of the subway line towards the Bronx. The Queens Library in the neighboring borough also holds literary readings and workshops throughout the week. Solitude at Wave Hill. Photo by Shinya Suzuki. It’s almost difficult to think of New York City as a cluster of islands amid its skyscraper-dominated skyline and fast-paced life. But when a friend told me about Rockaway Beach on the far end of Queens, I started scrolling through Google Maps to find other sun-and-sea spots in the city. Turns out just a short distance with public transport – at Coney Island Beach in Brooklyn, Great Kills Park on Staten Island or Orchard Beach in the Bronx – you can find yourself lying in the soft sand and swimming in the gentle waters on a summer day. See the list of New York City beaches here. Coney Island Beach. Photo by Filipp Solovev. If you’re a digital nomad like me, you’ll love Bryant Park for offering free Wifi amid the wilderness. Find a quiet corner and set up your office under a tree, amid the colors of spring or autumn, in the distant backdrop of midtown Manhattan’s skyscrapers. Chances are, your inspiration will outdo your device’s battery life! Bryant park. Photo by Gaurav Mishra. There’s always something going on in New York; you just need to find it. I spent one surreal evening at an Iranian gathering, listening to Rumi’s poetry recitals and heart-stopping music made on the 5000 year old Tanbur. And another, watching a breathtaking flamenco that transported me back to the gypsy quarters of Andalusia. Check out NYCgo and TimeOut for free cultural events while you’re around. 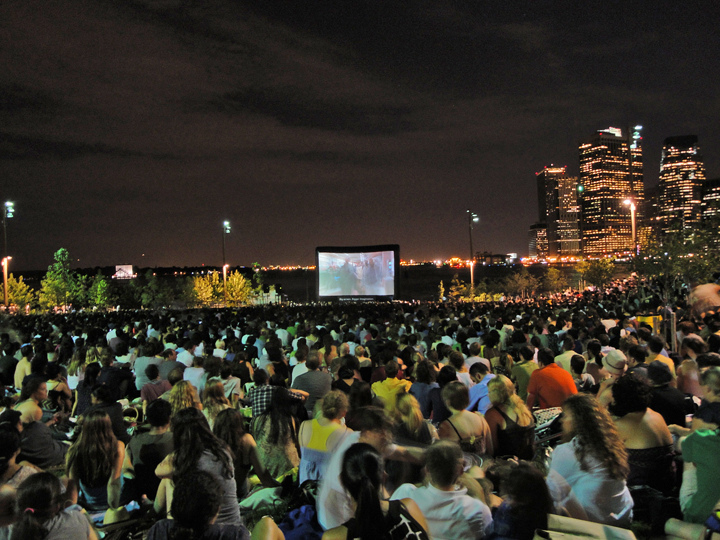 Outdoor movie in Brooklyn. Photo by Katie Killary. They say that the best things in life are free, and so it is in NYC! Find yourself sipping some of the world’s finest wines, rums and champagnes at a tasting session at Union Square Wines & Spirits in Lower Manhattan – without paying a penny, unless you really like what you taste and can fork out cash to buy a bottle. You’ll also find daily free wine tastings at Big Nose, Full Body in Brooklyn, and 67 Wines & Spirits on Manhattan’s Upper West Side. Cheers! Wine Tasting. Photo by USAG Livorno PAO. I’m off to Guatemala soon! Join me on Facebook, Twitter and Instagram to follow my adventures in Central America. I hope you get a chance to go soon, Richa! It would’ve been nice to meet you. Too bad you’re leaving tomorrow. Glad that you enjoyed my city. Safe travels. My home isn’t always expensive, and it’s the greatest city on the planet. 😉 Check out this post from The Shooting Star and see what I mean. Wow that’s awesome Shivya. I was in NYC this year in winter but was not aware of free Kayaking and free beer.and wine tasting. That’s amazing. This city has so much to offer. And one of the most vibrant cities of the world. I am currently enjoying in Minneapolis, the coldest cities of USA, even colder than Alaska they say. Why not come here some day and we would love to meet and host you. In case, from USA, you are heading to Mexico, do not miss to roam on the streets of Guanajuato and get literally ‘lost’ in it. Check my posts for a series of blogs on Guanajuato, one of the hidden gems of Mexico. Ah, now you have reasons to visit again 😉 NYC was really cold when I left, so I can only imagine what Minneapolis will be like! Thanks for the heads up on Mexico, will refer to your blog when I go. Well this is very informational . I have spent almost 10 day in NYC but haven’t done any of these things . Wish you had visited NYC two years back and I came to know these things then . But Thank You Shivya for providing so much insights of the places . Your Blog inspire me to roam more and your story is also very inspiring . Great tips! I’m sharing this! I only have limited time and don’t want to run from one place to another, but I’m sure I’ll be back and explore Mexico then. Or my plans might change and I might do it later this year! Definitely. Mexico is not to be missed by any count. And its a big country, so you will require more time at your disposal. Thank you for sharing all those inspirations. Have a safe trip! Great! And thanks, I’m loving it. Those are some great insider tips 🙂 Thanks for sharing! I’m relocating there in a couple of months. This helps immensely! Hi Shiva…loved this post…also wanted to check you have used the pics of other photographers…do you need to take permission from each of them….or if it’s publicly available you can post it into your blog w…obviously giving due to credit to them? Haaa, would love to do these things the very sooner. Thanks Shivya. We are planning to visit NYC this November. Can you tell me what was your budget? Previous PostThe Coolest Way to Fly Out of India! Next PostA Glimpse of Antigua, Guatemala.